Coby has been producing Android tablets for a couple years now, and in the spring of 2012 they debuted a bunch of new models with Android 4.0 and screen sizes from 7", 8", 9", 9.7", to 10.1". The Kyros MID 1042 is the only 10" model, and little separates it from the 9.7" Kyros tablet apart from the screen geometry (and that the MID 9742 also has a 2MP camera on the back). 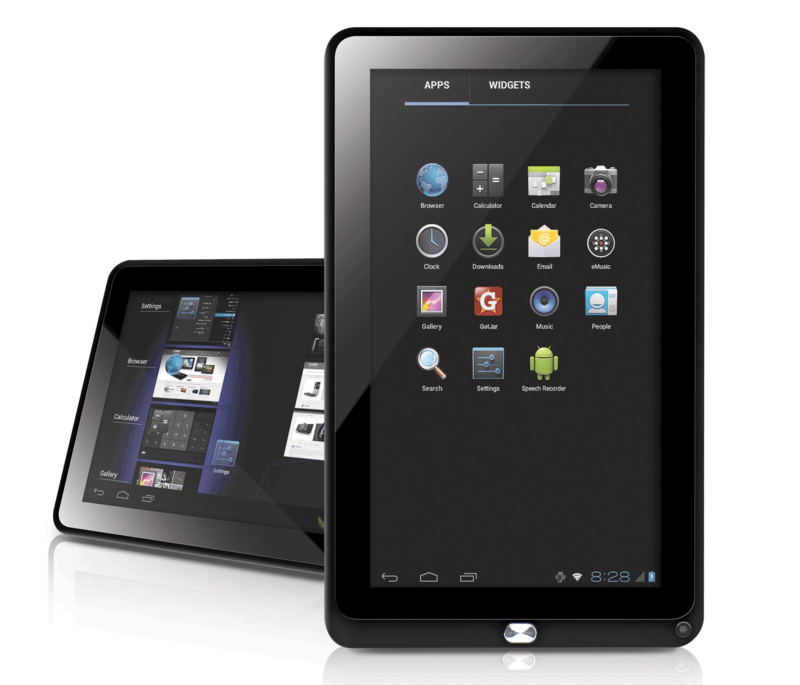 The Coby Kyros MID 1042 is one of those tablets where a review could go either way. It's right in that gray area of being decent enough to not bad and but still not quite earn the label of good. I'll be honest with you; I don't like using this tablet. Given the issues I encountered, I have to say that I find this tablet quite frustrating. I think there are better options in this price range. In fact, as I sit here writing this I can say that I think the Ematic tablet I reviewed last week was better, and it cost 20 bucks less. 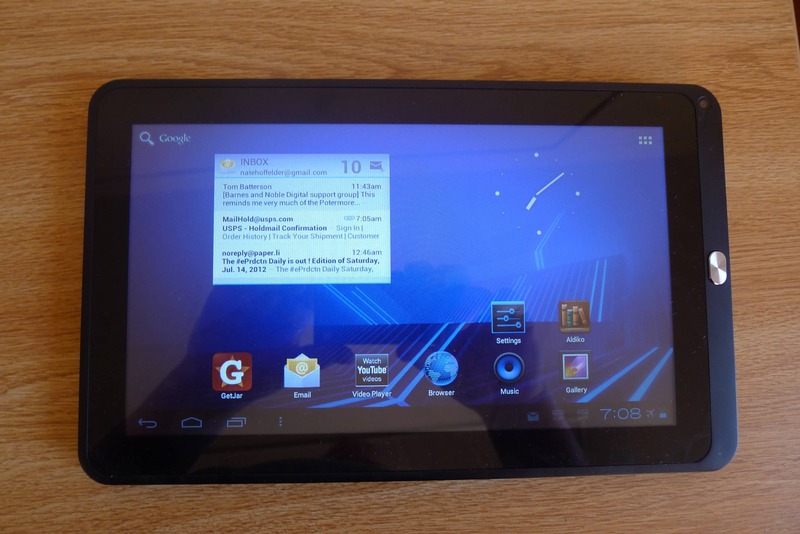 This is one of the tablets that Coby debuted in the Spring of 2012. It's running Android 4.0 on a 1GHz CPU with 1GB RAM, 8GB Flash storage, a microSD card slot, Wifi, and a g-sensor. This model has both a VGA camera and a microphone. The touchscreen is capacitive with a resolution of 1024x600. This tablet is both heavy and thick. It feels like it's the heaviest of the tablets I've reviewed. The back is a matte black with one speaker and a reset button. Like many tablets these days, the Kyros MID 1042 has all the ports, slots, and buttons down at one end of the tablet. On the upper edge are the volume and power buttons, and to the right of the screen is a back button. The webcam is above the back button, and on the right edge are ports and slots (USB Host, microSD card slot, USB client, microphone, power, HDMI out, headphone). The touchscreen performed well, right out of the box. There was no lag, mistaken presses, or other issues. Angry Birds worked fine. But I did have trouble waking this tablet from sleep mode. No matter what position I held it in, the tablet assume that it was in landscape mode every time I woke it up. Since I usually woke it up while holding it in portrait, this means that I always had to wait for it to notice. Also, it usually took whatever app I was using some time to realize it too needed to switch to portrait. This delay happened every time I woke the tablet, and it got irritating after a while. I'm also not happy with how slow this tablet was to respond in general. Playing Angry Birds went fine, but trying to load levels, restart them, or navigate through the menus tended to take a while. The same goes for loading other apps. And just to be clear, I'm not faulting this tablet because it doesn't compare well to a premium tablet; I think it's laggier than other budget tablets. Like the MID 7033 I reviewed a few weeks back, the Kyros MID 1042 ships with a sparse set of apps. It has the minimum set of utilities (browser, file manager, email, media players, etc) as well as the GetJar appstore, a link to Youtube, and the Aldiko reading app. Compared to some 10" tablets on the market, that's a rather limited set of apps. But it does cover the basics. This tablet ships with GetJar, but I'd much rather have Android Market. Unfortunately, I couldn't get it working after I used my usual instructions to install it. The app kept crashing. Luckily I was able to download and install the Amazon Appstore. I had a little difficulty at first, but that was due to the fact that I'd registered too many devices. I've downloaded a couple apps, including Kindle and Angry Birds. VGA webcams on budget tablets usually disappoint, and this one was no exception. This is a category which I usually gloss over because most budget tablets meet a certain basic ability to play music and video. But not this tablet. Do you know how a lot of Android tablets lately have a 400MHz Mali graphic chip? I don't think this one does, and that might account for the poorer performance. I haven't been able to test this as extensively as I would have liked, but I would say that this tablet should last a full day of moderate to heavy use. I've now used it at least 5 hours since charging it yesterday, and it still has life left on it. Yeah, that lagginess is something I noted with the 9.7″ one from just a brief fondle. It makes me wonder what the Cruz T508 (the iPad Mini-like one) will be like. 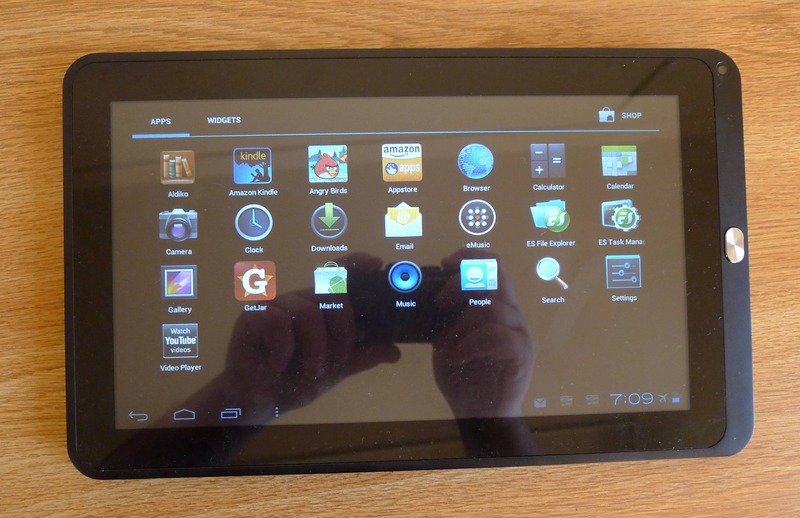 A review of a junky 9.7 inch tablet makes you wonder about a junky 8 inch tablet? I don’t know that it’s junk yet. And at some point they might not be junky. Look at Nexus 7 for just $199. Actually the specs dont look too bad assuming the price is right. However, I am tired of these tablets with NO Google market by default. I own apps and I want to use them from the getgo without dicking around with some hack. Therefore, it still gets the junky label from me. Hi Bill I had a 1042 for a while and at Kingstonoffice.com I found an app that worked for Android 4. Good luck with your tablet, but I found mine too slow and limited with apps, so I returned it. Why did the verdict come first??? This one is not seamless as it is written on the box, too slow. Always shows wait or close pop up. And when you use it while charging this one’s no good, it suddenly exercises its multipoint touch ability, like when you touch a certain point it will also take effect on any point on the screen. I never knew this one could be worst, given that it has been produced by coby. And one more thing, battery also drains so damn fast. Very disappointing.